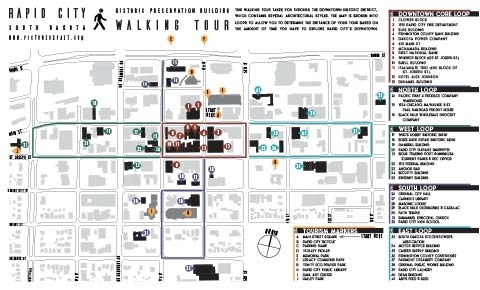 This walking tour guides you through the downtown historic district, which contains several architectural styles. The map is broken into loops to allow you to determine the distance of your tour based on the amount of time you have to explore Rapid City’s downtown. The Downtown Core Loop is a short trip through the history of downtown's architecture. This area contains many iconic buildings from Rapid City’s history. One of the tallest buildings in town is the Alex Johnson, located at 523 Sixth Street. The project construction began in August 1927, only one day before work began carving the granite faces of Mount Rushmore. Other notable buildings include the Buell building, the Duhamel building, and the original 1915 Rapid City Fire Station. At the west end of this loop is the First National Bank and at the east end of this loop is the Motor Service Building. The North Loop highlights Rapid City’s early railroad history, taking you down 7th Street to the original 1924 Chicago, Milwaukee & St. Paul Railroad Freight House. Passenger depots and warehouses were build track side to accommodate travelers and the shipping and receiving of products. A number of these were built by the Railroad. The East Loop enters the East of 5th District. New businesses fill formerly vacant storefronts, bringing tourists and citizens alike into the area. This walking loop includes the historic Pennington County Courthouse, the Creamery, and the Rapid City Laundry Building. The Rapid City Laundry was built in 1929 for commercial laundry function. The West Loop takes you west of the historic downtown core past historic signs at Who’s Hobby and Bob’s Shoe Repair. On the west side of Mt. Rushmore Road is the Gambrill Building, the Rapid City Garage (current Murphy’s Building). At the far west edge of this loop you will pass the original Sioux Trading Post and Minnilusa History Museum, now home to the Rapid City Department of Parks and Recreation. The building was constructed in the early 1930’s by the WPA on the site with Halley Park (1915). This is also a former location of the 1879 “Pap” Madison Cabin. As you walk east, back towards downtown you will pass the 1912 Federal Building which originally housed both the federal offices and the Post Office. The South Loop winds south of downtown, passing the original 1908 City Hall, the 1915 Carnegie Library, and 1923 Rapid City High School, which now contains the Performing Arts Center. During the summer of 1927, President Calvin Coolidge spent three months in the Black Hills. The Rapid City High School was coined the “Summer White House” maintaining a local office for the president to conduct his portion of the nation’s business. Other notable buildings on this loop are the Faith Temple Emmanuel Episcopal Church, and the Original Black Hills Oldsmobile and Cadillac.